​Actually, don't call my agent. At least, not yet. But I am celebrating that I have just signed with Jennifer Chen Tran of the Bradford Literary Agency. She'll be helping me find a publisher for my book on the sinking of the SS City of Rio de Janeiro and, hopefully, much more to come. I can't wait to get started! This is the time of year when lots of writers are looking ahead to November and what is possibly one of the most masochistic things writers ever do to themselves: National Novel-Writing Month (NaNoWriMo). The objective of course with NaNoWriMo is to write an entire novel of 50,000 words over the course of a month. Although many writers like to jump in on November 1st with nothing more than a bare idea and a blank page, others choose to do prep work. If you're playing by the rules, you can't write any text of the novel prior to November 1st, but you can make notes, do outlines, write character sketches, and any other kinds of pre-writing that may (or may not!) help you hit the ground running and make that 50,000-word goal easier to achieve. I am still considering whether or not to jump into the NaNoWriMo frenzy this year. I tried several years back and got to about 27,000 words, but I think I could do better now. While I try to make up my mind whether or not to commit, I'm sorting through story ideas that I have in reserve and considering how I would want to prep one. This morning, with this in mind, I came across a blog post from writer Amy Stewart, who has a great idea of how writers can adapt the concept of thumbnail sketches that artists use to create a painting to their own work. Basically, she writes out a brief sketch of what will happen in the next scene or chapter she's going to write, discussing what the scene or chapter needs to accomplish, and what she may know or not know about how it's going to play out. With that done, she's then ready to write the full piece based on the sketch she's written. I like the adaptability of this idea, because you can go micro (sketching out one brief scene) or macro (sketching out a whole novel, basically a synopsis or treatment) with it. You can sketch out all the scenes or chapters in your book, or just the key ones that are particularly complicated or challenging. That avoids the problem I've run into with outlines--I can never finish them because I never know enough in advance to fill in all the holes. I also like that sketching out scenes in advance is a good way for me to remind myself to make sure I'm injecting enough conflict into the story and not letting things just coast along. So now for the rest of October, I'll be playing around with written thumbnail sketches while I make up my mind whether to NaNoWriMo or not to NaNoWriMo. I confess that the book I'm completely obsessed with is the same book that a lot of Americans are reading right now: Fire and Fury: Inside the Trump White House by Michael Wolff. It is as compelling and laughable as the best gossip rag, while also being horrifying and, in some places, downright chilling. I'm listening to the Audible audio version, and the narration is kind of amusing because the narrator, Holter Graham, reads the Trump quotes in a little bit of Trump's voice. I may end up finishing it this weekend--that's how hard it is to put this book down. Beyond Fire and Fury, I have some reading to do related to my research on the SS City of Rio de Janeiro. I just got Crossing the Bar: The Adventures of a San Francisco Bay Bar Pilot by Paul Lobo. I'm hoping it will give me some good insights into the issues of navigating the Golden Gate and the Bar Pilots organization. Also in the lineup for January is The Woman in the Window by A.J. Finn and Hunger: A Memoir of (My) Body by Roxane Gay. In January 1998 I made the leap from full-time employment with a major publisher to full-time freelancing as a book indexer, editor, and proofreader. My reasons for jumping ship were common to many other freelancers--I didn't see much of a future with that company in terms of quality or security of work, and at the time I had a nightmare of a boss. I quit and my former employer became my first--and for a while my only--client. Twenty years later, that company is still one of my major clients. But along the way, I've learned a few lessons about freelancing, some painfully obvious, others a bit more obscure. Lesson #1: Never jump ship with just one client! Lots of people do this and, to be honest, the one-client life worked out OK for me for a while and I did add clients slowly. But it's really dumb to be a single-client freelancer. It's like having all the limitations of being an employee with none of the benefits. I'll never make that mistake again and I'm actively on the hunt to add new clients, particularly for the indexing side of my business. Lesson #2: Don't let yourself become isolated. As a new freelancer, I was a member of a few professional organizations, but at that time they didn't have the online resources that those organizations have now, so unless you went to their conferences, which could be expensive, it was hard to benefit from them. Eventually I let the memberships lapse, and with them the connections with my peers. But gaining and maintaining connections with other people who do the same work as you is invaluable. In recent years I've found or re-discovered two professional organizations (the American Society for Indexing and the Garden Writers Association) that have been a big boost to my business. I've found new clients through them and established real friendships with people who understand the triumphs and travails of the freelancer life I'm living. Lesson #3: If you're spending more on upgrading equipment than you are on upgrading your skills, you're doing it wrong. Fast, dependable equipment is definitely important, but it only gets you so far. After all, anybody can get a fast computer and smart software. Investing in your own skills--adding skills, polishing skills, and occasionally reaching out into new areas--makes you unique, and uniquely appealing to clients. When I studied horticulture a few years back and started garden writing, it not only led to my publishing two gardening books; it also opened up a whole new subject area for my editorial services. If you hire me in January 2018 to index a book for you (even if that book isn't quite ready for indexing just yet), I'll give you a 10% discount (up to $50 maximum) off the total cost. As long as the book will be in final pages and ready to index by March 31, 2018, you can book me in January and I'll give you the discount when the book is ready. Want to talk about it? Shoot me an email at CASplan@sbcglobal.net to let me know about your project. We'll set up a time to talk by phone and work out the details. I can't wait to work with you! So happy new year to one and all! And happy anniversary to me! Back in 2013 I discovered a group that really was exactly what I needed as a writer. I had published my first gardening book the year before and had been blogging for several years but at that point I wasn't really sure what to work on next. I just knew I had to keep writing and I was unsure how to keep the momentum going. The group that proved to be a major boost in keeping that momentum going is Shut Up & Write. 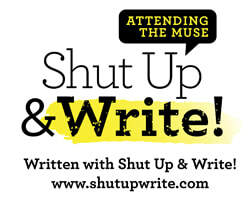 Shut Up & Write is a writer community with over 16,000 members in 20 cities and four countries. I don't remember how I found it, but somehow I came across a listing for a Shut Up & Write meeting in my town at a cafe. I RSVP'd on Meetup.com and just showed up. It was a small group, maybe four or five of us that day. But there were two things about it that really clicked for me right from the start. First, I loved hearing the variety of things that people were working on because Shut Up & Write is open to anyone who is writing anything without regard to subject or publication status. And second, perhaps most importantly, the emphasis is really just about getting the writing done. Nobody reads your work or checks to see if you've met a word count target. It's all about showing up to commit some time to writing. And let's face it, that's how books (and poems and screenplays and theses, etc.) get done. I kept going to that Shut Up & Write meeting and when a new organizer was needed to take over the session, I happily took it on. I'm still the Event Organizer for that group, which now meets for three hours every Tuesday afternoon. I attend other Shut Up & Write sessions on occasion as well and am the Co-City Manager for the SF Bay Area chapter. These sessions energize my writing and make it a less isolating endeavor. Since I've been going to Shut Up & Write, I've written and published another gardening book, written and self-published a short gardening ebook, and written and begun shopping around a proposal for a nonfiction book I am dying to write. In addition, I've continued to work on a novel. I honestly doubt I would have gotten that much writing done without Shut Up & Write. In addition, I've made many new writing friends and learned so much from them. If Shut Up & Write sounds like something you'd like to check out, go to shutupwrite.com to find out if there's a group meeting near you. If there isn't and you'd like to start one, fill out the contact form on the website and the folks at HQ will help you get started. ​For me, being a blogger is a little like being a jogger (without the desired calorie burn). Hitting the “Post” button at the end of a satisfying screed is probably as close as I’ll ever get to feeling a runner’s high. Blogging can be a release, a purge, or a cry into the abyss. It can be a way to carefully work out thoughts and feelings or a mindless spasm of words. On the other hand, however, blogging is less sweaty work and rarely leads to shin splints. But, as with jogging, blogging uses muscles that you probably don’t use in any other activity. And after you’ve stopped blogging, those muscles get stiff and cranky. That’s where I’m at right now. When I got interested in gardening, I started a blog, primarily as a way to record what I was doing in my garden and what I was learning. Lots of good things came from that blog, including professional writing opportunities and some great friendships. I blogged for seven years, but the last couple of years were a bit of a slog, not something I really enjoyed as I had at the beginning. I finally stopped posting on that blog a couple years ago and I must admit, it felt good to pull the plug. But here I am again, starting a new blog. The focus here will be broad, although I expect there will be much about writing, reading, publishing, and there may even be a political rant now and then (although these days I try to keep my political ranting limited to Twitter). I’m working on a couple of writing projects that I’m excited about and I look forward to blogging about them. I hope any reader who comes across this blog will bear with me as I try to find my blogging legs again. Consider this first post a warm-up. We’ll see where it goes from here. This is where I throw thoughts on the wall to see what sticks. Like spaghetti, but with words.